Gettysburg, Pennsylvania is sight of the deadliest battle in American history, but also the sight of one of the greatest speeches ever given by an American president. 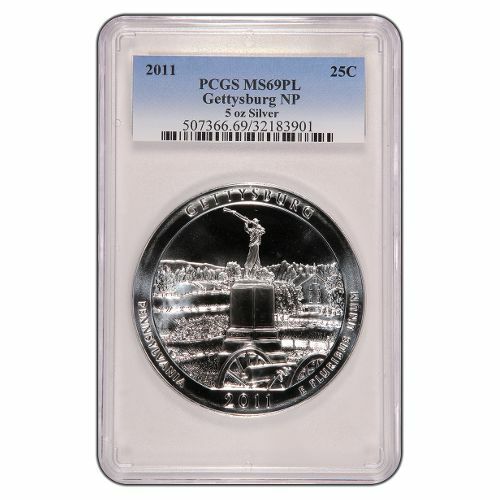 Gettysburg National Military Park is hallowed ground, and is honored on the 2011 5 oz Gettysburg ATB Silver Coin, which is now available from Silver.com in near-perfect condition. Almost 7,194 coins exist in this grade and condition! Face value of $0.25 (USD) fully backed by the federal government. Ships in a PCGS plastic slab. The Battle of Gettysburg was the single deadliest battle in American history. Over the course of three days, Union and Confederate forces clashed in the hills and forests around the small town of Gettysburg as the Confederacy made its deepest incursion into the North. The Union victory at Gettysburg, although costly, is widely considered the most important turning point in the Civil War. 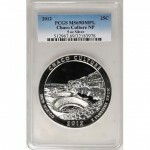 Each of the coins available to you today through this Silver.com product listing has a Mint State 69 grade from the PCGS. 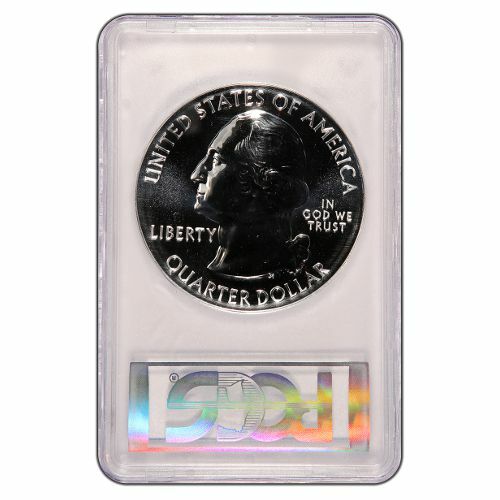 Coins with this grade have their full, original luster, and no more than two minor flaws visible on the surface. Though these are bullion coins, they feature a brilliant proof-like finish. 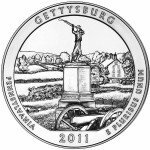 The reverse side of each coin features the statue of an infantryman as he stands on the battle line along Cemetery Ridge. Engravings on this side include “Pennsylvania,” “Gettysburg,” “E Pluribus Unum,” and the coin’s year of minting. On the obverse are the images commonly found on American circulation quarters. President George Washington’s profile is surrounded by inscriptions of “United States of America,” “Liberty,” “In God We Trust,” and the coin’s face value. America the Beautiful coins are struck by the United States Mint at three of its four production facilities, with only the Denver Mint left out of the coining process. The 56-coin series launched in 2010 and is planned to run through 2021. If you have questions for a Silver.com associate, don’t hesitate to reach out to us at 888-989-7223. You can also connect with us online through our live web chat feature or by sending us an email. If you are interested in similar products, be sure to visit our Certified Silver Coins page.